Dr Juhi completed her 5 years BDS degree at the prestigious Manipal University in India in 2005, graduating in the top 5% of her class. Her prime interest in aesthetic dentistry and orthodontics resulted in joining the full-time 3 year Master of Dental Surgery (MDS) program in India, where she again topped the university. During her training, Dr Juhi completed research on facial attractiveness, evaluating the importance of an aesthetic smile. In 2012, she joined EBDG, delivering personalised treatment to patients with the highest quality of care at an affordable cost. Dr Juhi is sensitively attuned to the aesthetic and functional concerns of her patients. 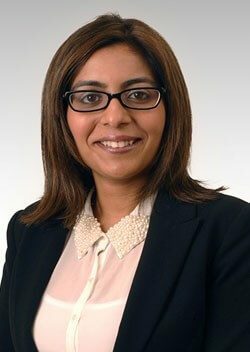 With a special interest in orthodontics, Dr Juhi combines her scientific background with an artistic eye to bring personalised care to each of her patients. Her approach is caring, gentle, and understanding towards kids and teenagers, making orthodontic treatment an enjoyable and special experience. For adult orthodontic patients, she listens to the needs and concerns of her individual patients and maintains a professional working relationship, allowing patients to discuss in confidence about their aesthetic issues. Memberships and Certificates: Australian Dental Council certificate (General Dentist), Certified Invisalign Provider in Australia. "Dr Juhi is an accomplished, respected and highly qualified dentist with extensive experience and a special interest in orthodontics. She is also a certified Invisalign provider in Australia."